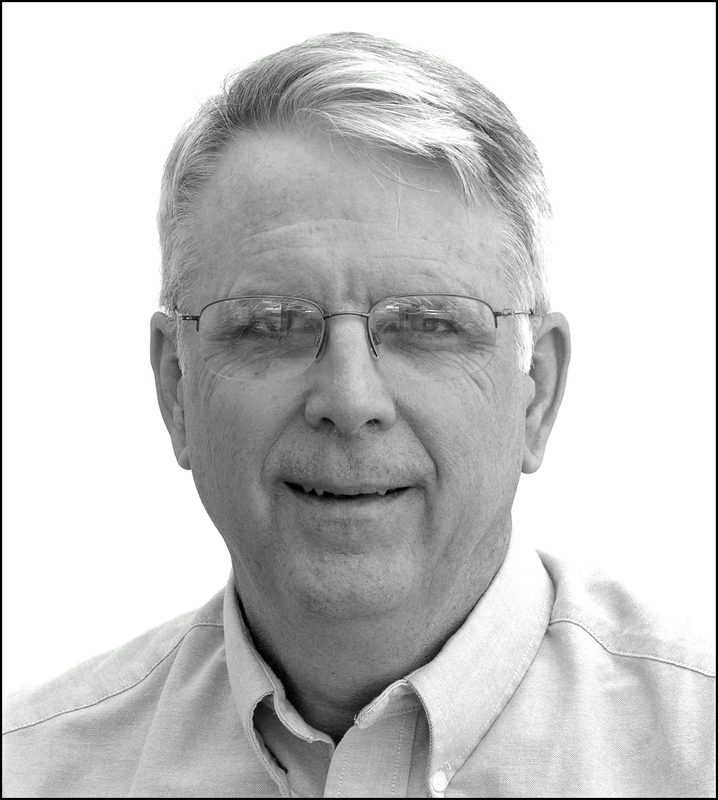 Dr. Ron Graybill has served his communities in a variety of ways over the years: professor, journalist, communications specialist, editor, and pastor. A native of Northern California, Graybill spent third grade at Pacific Union College Elementary School while his mother trained at PUC to be a teacher. He now has an M.Div. degree from Andrews University, and a Ph.D. in American religious history from Johns Hopkins University. Graybill spent 13 years as an associate secretary at the Ellen G. White Estate at General Conference Headquarters, where he assisted Arthur White in writing the six-volume biography of Ellen G.White. His many articles on Adventist history made him one of the most frequently cited sources in the new Ellen G. White Encyclopedia. On Saturday, March 9, Graybill will present this perspective during the 2019 lecture of the Percy and John Christian Civil Rights Conference Center at PUC, titled, “James Edson White: Flawed Hero.” This lecture is free and open to the public and will begin at 4 p.m. in Paulin Hall. Tell us about your lecture. What will you be talking about? It is the story of the life of James Edson White, with emphasis on his pioneer evangelistic, educational, and humanitarian work among Mississippi Blacks between 1895 and 1900, but with little-known aspects of his troubled childhood, youth, and young manhood. My presentation will also describe the sort of paternalistic racism which characterized most social action by whites during that era. Much of what you will be saying in your lecture is an elaboration of your 1971 book, Mission to Black America, which was just released this month in a second edition. Tell us a little about that book. In Mission to Black America, I tell the harrowing, yet inspiring story of James Edson White’s heroic and misunderstood efforts to spread the advent message among the Black people of Mississippi in the late 19th century. The Black people were willing to listen, but not everyone wanted them to hear. To write the book I visited several sites in Mississippi, interviewed persons who lived through the events described and made use of unpublished and confidential correspondence between Edson White and his mother, Ellen G. White. During my research, I even uncovered previously unstudied court records on the Olvin murder case. I think its application to current issues make it still a very relevant tale today. Can you elaborate on that last part? What, in particular, makes this story relevant today? We are in an era when the long-standing racism of much of American society has come more obviously into view. Understanding how even the most progressive individuals in the past still had racial flaws helps us become more aware of our own unconscious assumptions and feelings about race, and thus better able to admit and overcome them. I understand you’ll be guest lecturing in a number of classes while you’re here. What will you be talking about? I will be lecturing in religion, history, and English classes on Ellen White’s unreleased handwritten documents. While it is said all her letters and manuscripts are released online, it is only the polished, edited versions of those documents that have been released. I will show how a careful study of the holographs (documents in the author’s own handwriting) brings new evidence to light; evidence that has been lost in the process of correcting, editing, and polishing her documents for publication. I will also expose students to the discipline of documentary editing, showing how original handwritten documents are now commonly prepared for scholarly publication so as not to lose any of the information found in the handwritten drafts. In this study, I will make use of the previously unknown Ellen White letter that was just discovered in the PUC Library’s archival collection. How did your intense interest in the White family begin? As we discussed racial issues and pushed racial reforms in the 1960s, I became aware of how Mrs. White’s apparent support of segregation loomed behind the scenes. Then I discovered the historical background that rendered her statements more understandable and defensible, as well as her clear but long-forgotten condemnation of racial discrimination. My research in these topics and my book about Edson White won me the appointment to the White Estate to assist Arthur White in writing the six-volume biography of his grandmother, Ellen White. What sparked your passion for positive race relations in particular? My high school girlfriend was part Mexican, part Apache, and part French. I had an aunt who thought it was terrible I should date “such a person.” Her views on race fueled my passion for better race relations. What do you hope students who attend this lecture will take away from it? My hope is this lecture will inspire a chastened pride in some aspects of the American and Adventist past. What I mean by that is it is possible to be proud of our heritage without denying or forgetting the mistakes our ancestors made. We can acknowledge we represent the results of those mistakes, but in recognizing these things we can also move forward positively in our church, in our communities, and in our country. 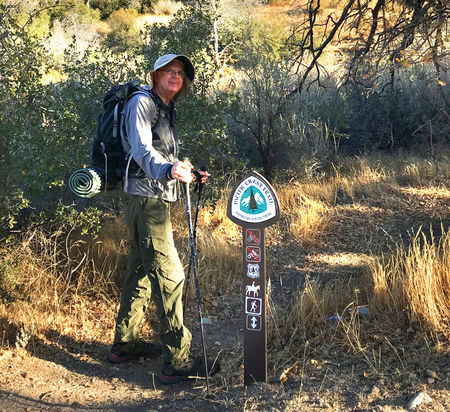 Dr. Graybill’s current hobby: Hiking the 2,600 mile Pacific Crest Trail in one, two, and three-day sections. He’s done about 600 miles, all in Southern California. Starting college can be challenging, but at Pacific Union College, we have great resources in place to help students succeed. There are several invaluable resources and support services at your disposal when you’re a PUC student and if you’re struggling with something, it’s important to remember you aren’t alone. There are people in place who are available to answer your questions or provide you with additional information—you just need to ask for help. What tutoring is available at PUC? Yes! Our Teaching & Learning Center offers free group tutoring in over 25 different subjects, ranging from business to languages to science. Most lower-division GE courses have tutoring options available. If you’re struggling with a class but don’t see a tutoring option available, talk with the helpful TLC staff and they can set you up with a small group or an individual tutor. There’s also a writing lab available to students who would like input and direction on writing papers—it’s a great service and one you should absolutely take advantage of! Learn more about the Teaching & Learning Center. What can I do at the library besides study and check out books? In the age of Google, a lot of people think libraries are obsolete, but that’s definitely not the case! 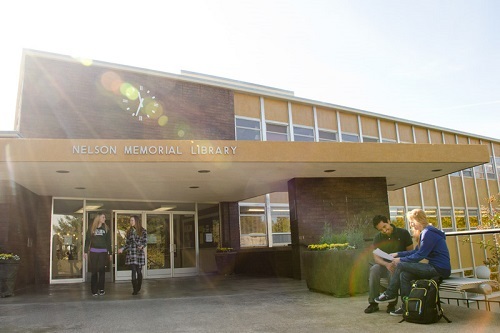 At PUC’s Nelson Memorial Library, books reside there of course, but also online databases, academic search engines, journal articles, and periodicals. Through the library, students have access to over 30,000 journals and 100,000 ebooks, and over four million books through interlibrary loan services. 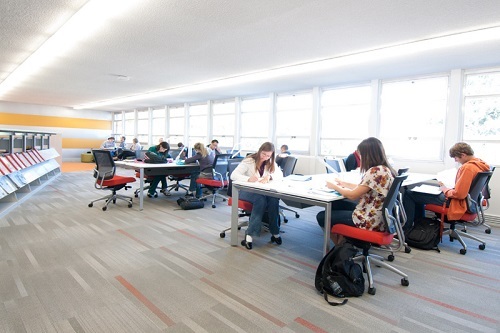 If you need to use a computer, there are also about 60 public workstations available within the library and the computer lab areas, along with large group study rooms if you need a place to study with friends for that Anatomy test. There are also very knowledgeable librarians available to help you navigate all of these resources, so don’t be afraid to ask for help! 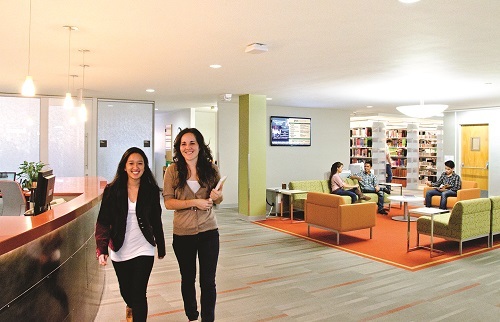 Get helpful tips for using PUC’s library. Is there someone who can help me with registering for classes? Once you’re a student at PUC, you will be assigned an advisor in the area you’re studying. For example, if you’re planning to study business, your advisor will be a professor in the department of business (helpful, right?). Your advisor knows the ins and outs of their department’s programs and will be a valuable source for any questions you have about what classes you should take, what major you should consider for your career path, and more. Every quarter your advisor will need to approve your schedule, which is a great safety net for making sure you stay on track to complete your degree! For undecided students, the TLC has an undeclared student advisor who will work with you on what general education classes to take while you figure out what to major in. If I don’t know what I want to study, is there someone at PUC who can help me? Some of you may not know what you plan to study yet, and PUC’s Career & Counseling Center can help you figure out the path you want to be on. They have a career counselor who can give you a career test and one-on-one help with career counseling. If already you have an idea of what career you want but aren’t sure how to get there, they can help you with your resume, cover letter, and even conduct some mock job interviews with you. There’s also an annual Career Fair, held every winter quarter, where you can meet with professionals from many different industries to network and learn more about the possibilities available after college. It’s a great event to provide you with a chance to see how your education at PUC can help you continue on to new and exciting places. 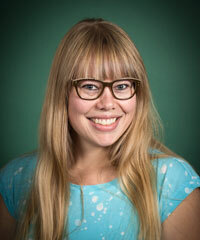 Meet Sydney Johnson, PUC’s career counselor. What services are there if I get sick? Did you know PUC has a free health clinic available to students? It’s true! Health Services provides students with a wide array of services, including appointments with a physician, physician’s assistant, or a nurse, along with medications (both prescription and over-the-counter), medical supplies, and diagnostic in-clinic testing. The Health Services clinic strives to be a welcoming professional place offering the highest quality of care possible, and wants your experience here at PUC to be a happy and healthy one! We are so thankful to have the clinic on our campus to provide our students with excellent care when they need it. Get to know PUC’s Health Services clinic. If you have questions about the student resources and support services available to PUC students, you can talk with one of our knowledgeable admissions counselors, who can give you more information. Call (800) 862-7080, option 2 or email admissions@puc.edu to get connected with a counselor now. Some people are surprised to learn librarians are faculty, and they teach, too! Patrick Benner has been teaching college students how to find the resources they need since before the internet was a thing (sorry, Patrick! ), and he’s really good at it. His office is really easy to find (at the end of the circulation desk in the library lobby), so pop in and say hi, or ask him a question. He’s also got some pretty cool technology toys (and relics!) in there. Go check it out! Classes Taught: All librarians teach as guest lecturers on information literacy—discerning good sources from poor sources, how to make use of the library’s extensive resources, and how to improve your search strategies and chances of finding what you are looking for. Each of us is assigned to work with certain departments. I work with all the fun ones which include Math, Physics, Chemistry, Aviation, Nursing, and Emergency Services. Where did you grow up, and what did you want to be when you grew up? I was born in Sacramento General Hospital and grew up in the capital city, mainly the northern areas of Fair Oaks, Carmichael, and Citrus Heights. I remember as a little dude I wanted to be a scientist and later on an archeologist. As my relationship with God began to develop, I started aspiring to be a missionary. Yes, I read ALL the missionary story books by Josephine Cunnington Edwards and others. Years later I was overjoyed to be able to serve as a student missionary teaching math, science, English, and Bible. So what made you want to become a librarian? Someone bet my mother she couldn’t teach me to read before I was 3 years old. Big mistake. My mother rarely lost bets and according to her, by the time I was two and a half I had learned my alphabet and was reading. I remember stacks of word cards that started out small like “the” and “cat” and then went up to larger words like “something” and “purpose.” I have been an avid reader ever since. In the grocery store, I talked mom into buying me a copy of Alice in Wonderland I saw on a book rack when I was probably 8. I LOVED libraries but they were never close enough to where I lived. I was thrilled when I got to Junior High because the large campus for the 2,000 7th & 8th graders had their own library. I was constantly checking out books reading my way through each genre they had. Towards the end of my 7th-grade year, I had spent so much time in the library the librarian actually approached me and asked if I was interested in working there the next school year. Wow, I thought I had died and gone to book heaven! A typical day for me is unpredictable. It may include things like helping a student find sources for a paper, answering tech support questions, gathering statistics for federal reports, dealing with a flood in the lower bathrooms, teaching a class in the computer lab, tracking down a bug in the code of the library room reservations website, attending administrative committee meetings, updating the Faculty Handbook, directing student workers, planning for future changes to our physical spaces, interacting with a multitude of vendors who supply us with many resources we subscribe to and purchase, troubleshooting malfunctioning printers, scanners, computers, or any of the associated software, buying equipment or repair tools or software or online databases, and, of course, answering phone calls and emails. Where is your favorite spot in the PUC library? I think it’s right here in my office because it’s close to the front lobby where the students come and go and it makes it easy for them to pop in to say “hi” or to ask a question. Hmmm let’s see, besides reading (is that a hobby?) I do enjoy dabbling in astronomy, chemistry, electronics, geology, biology, physics … mostly with kids. Actually, I’d say kids are my main hobby. Starting in high school (Sacramento Adventist Academy) I have been involved with church day camps, summer camps, Sabbath School primary and juniors, Pathfinders, etc. everywhere I have been. My other main “hobby” is spending time with Angwin Ambulance as a volunteer EMT and ambulance driver. Who is one of your favorite authors? Wow, if I have to start picking I will say Richard Feynman and Oliver Sacks. Oh, and Mary Roach is super quirky and educational; I love her audio books. Was I supposed to only pick one? What’s something people may be surprised to learn about you? I worked for 11 years in Lincoln, Nebraska, for Christian Record Services for the Blind and Deaf. During that time I learned enough sign language to converse and also helped our deaf services department create the Pathfinder honor for sign language. I’ve spent most of my life in libraries. My mom was the librarian at my elementary school, and summers were divided between the swimming pool and the library. As a result of these experiences, libraries have always seemed like a second home to me, which is probably what led to my becoming a librarian! You don’t have to become a librarian, but I hope you will love the library as much as I do! Or at least a little bit. Being comfortable in and with the library will contribute greatly to your academic, and (dare I say), social, success. To that end, here are five tips for using the library. As I’ve just implied, a library should feel like a second home. The library has a variety of different sorts of spaces so figure out which one works best for the goal you’re attempting to reach. If you need to work in a group and engage in “lively” discussion, the main floor has an open study space and a couple of rooms to reserve. If you’re seeking quiet and solitude, the top and basement levels have many study carrels where you can focus on your work. There’s also a group viewing room on the bottom level where you can watch VHS tapes on a vintage TV (or DVDs, or streaming TV through a projector), or just gather as a group. There are multiple spaces for different kinds of work and you should keep all these options in mind when planning your schedule. I’ve already talked about the spaces the library offers, but wait, there’s more! Printing in the library is free. We have color as well as black and white printers, available for all your academic needs. There are also laptops to check out if you don’t own one, or if yours has recently experienced any sort of meltdown, or if you just need to use the lockdown browser to take a quiz. If you’re having trouble finding an article or book (or refining a topic, or finding one at all!) there is a librarian specifically on call to help from 8 a.m. to 9 p.m., every day during the week, and on Fridays from 8 a.m. to p.m. and on Sundays from 1 to 6 p.m. We offer books on every possible topic, so if you’d like to take up knitting or cook an elaborate mid-century meal, we have a book for that, although unfortunately, we can’t provide you the spare time required for such undertakings. One of the most important things you will learn about using the library is that no question is too small or large. If at any point during your research you find yourself lost, please find a librarian to talk to! There is no reason for you to struggle through the process by yourself, and we librarians are both able and willing. We librarians are a voraciously intellectually curious lot, so it’s fun for us to help you solve your dilemmas, be they tracking down a specific article, beginning an exploratory search of a broad topic, or refining a research inquiry. We’re also happy to tell you where the bathrooms are (we have them on each floor!) or help you find a book on the shelf. We welcome all (primarily academic) questions, from the straightforward and simple to the difficult and complex. While we are always happy to help you and answer questions, it is important to remember that research can be a long process which will require persistence and patience. It will always require a certain amount of reading and sifting through things, and it’s a process that will demand increasing amounts of your attention. As librarians, we want to make the process of finding these things as painless as possible, and give you methods that will continue to improve what and how much you find. It’s always going to take a certain amount of time, and the further you get into your discipline the more complex your research will be, so it’s important to accept the necessity of giving it your full attention. Additionally, we librarians are very busy. We all have responsibilities like teaching classes, choosing books and other resources for the library, and a variety of other things like cataloging materials, processing archival collections, maintaining systems, and information literacy assessment. Therefore, if we are not immediately available to help you, please bear with us. We will cheerfully help you once we’re back from teaching or off the phone or finished with helping another student. I keep talking about the librarians so it may seem repetitive to advise getting to know us. However, I stand by it! If you know us you will feel comfortable asking questions, and your Academic struggles will be lessened greatly. We are also completely awesome! 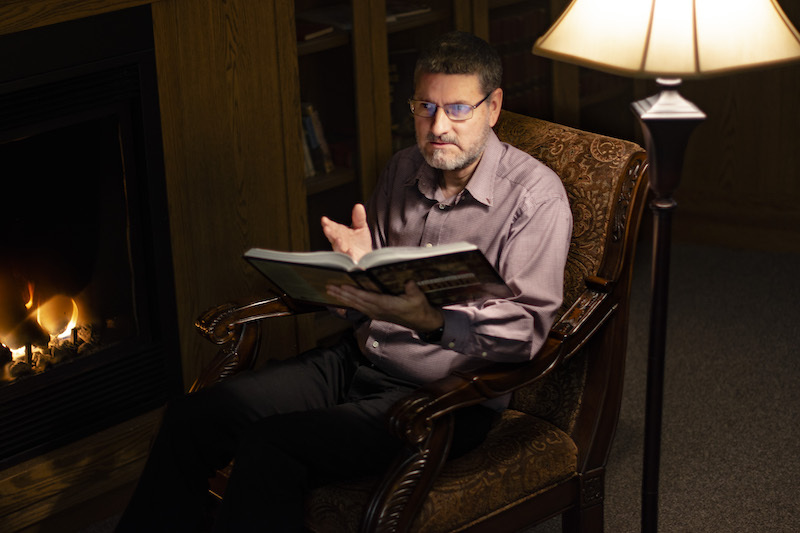 Patrick Benner is the library director, and he is the guru of all things technological. He also knows an awful lot about computer history and science fiction. Jason St. Clair is our cataloger, which means he makes sure all materials are in the library catalog so they can be found on the shelves. He is a musician and also reads a lot of sci-fi. Katy Van Arsdale is the special collections librarian and archivist, which means she maintains PUC’s history and deals with SDA scholarship. She wears fabulous nail polish and knows a lot about movies. And I’m Allison Fox, access services librarian—I deal with circulation and do a lot of instruction. I’m obsessed with sentence structure and argument construction, and pop culture. I hope this gives you some insight into using the PUC library! And of course, all you have to do to find out more is come in and ask. Katharine Van Arsdale is a Texan-turned-Californian who loves books. This is appropriate, considering her profession: She is one of our team of librarians here at PUC who helps students and other faculty find what they need. Katy adores her two cats, Mochi and Meeka, and has a passion for history. Without further ado, introducing: Katharine Van Arsdale! What made you decide to be a librarian? I’m a special collections librarian at an academic library, which is honestly my dream job. The “special collections” part means I get to work with rare books and archives full of old letters and photographs and diaries. It’s all the coolest stuff in the library. I knew I wanted to do this job when I was a kid and I visited museums. I saw all the interesting objects hidden behind glass and I thought to myself, “I want to be the one who has permission to touch all the historic things.” So that’s what I do now every day, and it’s great. The best part is that I work in an academic library’s collection, which means that I’m making these rare books and fragile photographs available to student researchers. I’m taking the cool exhibits out from behind the glass and sharing history with PUC, and I love that. I’m obsessed with National Parks. My life goal is to visit and hike in every National Park. California is a great state for this, because a lot of the most beautiful parks in the United States are here within driving distance of PUC. I grew up in Texas, and until I was about 10 I spoke with a thick Texan drawl. It’s totally gone now. Well, mostly. I love the campus. There are trees and flowers everywhere, and the views are always changing as you walk across the campus because it’s hilly. Many of the buildings are historic, and they have very interesting architecture. The campus is also special because it’s close to wilderness and city, mountains and ocean. From PUC, we can go for a hike in the forest preserve, or we can take a day trip to San Francisco. It’s all nearby. I love standing on the steps to Irwin Hall when the sun is setting. You get such a gorgeous view of the campus and the sky. My favorite book is “The Count of Monte Cristo” because it’s a glorious revenge tale but also a classic book, so you feel very cultured and smart when you finish reading it. If you have questions or problems with any stage of research or study, you can text the library. Did you know that? It’s true! We have a Text-a-Librarian number so you can get help even when you can’t come to the library. Try it—the number is (707) 948-6639! Here’s the latest installment of #FacultyFriday, where we feature a different faculty member each week. This year we welcome Jason St. Clair to PUC, where he will be working as the new technical services librarian in the Nelson Memorial Library. 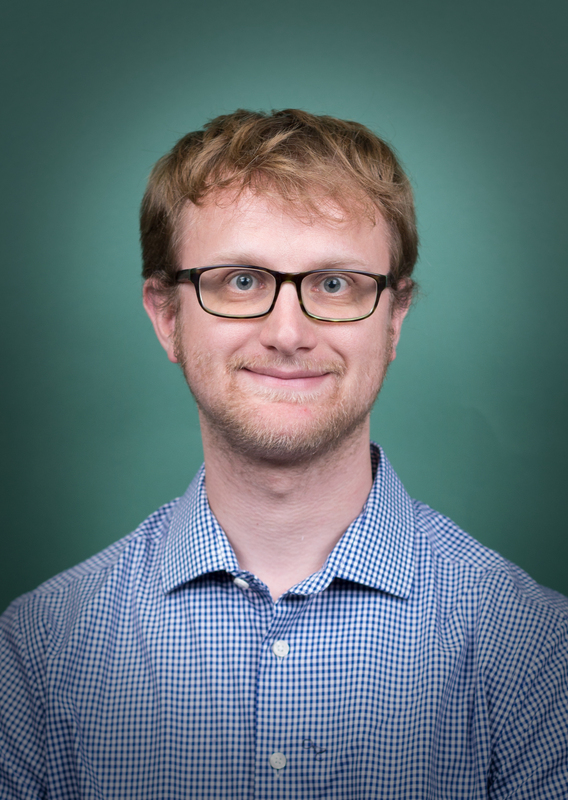 He joins us most recently from Andrews University, where he spent the past five years serving as the interlibrary loan assistant and more recently, the head of patron services and interlibrary loan manager. 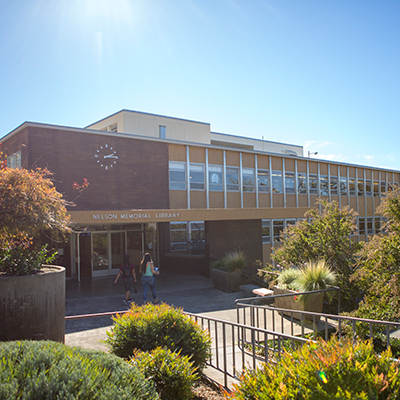 Previously, St. Clair served as the access services assistant and media center technician at the Peterson Memorial Library at Walla Walla University. Professional activities: “Adulting in the Library: Experiences of Millennials as Library Staff” presentation at 37th Conference of the Association of Seventh-day Adventist Librarians, June 25-29, 2017. I’m a very curious person and I love being surrounded by so much information and being able to explore different topics on a whim or learning something new as I assist a student in their research. I can name all of the countries of the world. What are you looking forward to the most about being at PUC? The close-knit feeling of the campus community. Being surrounded by trees and mountains and nature. 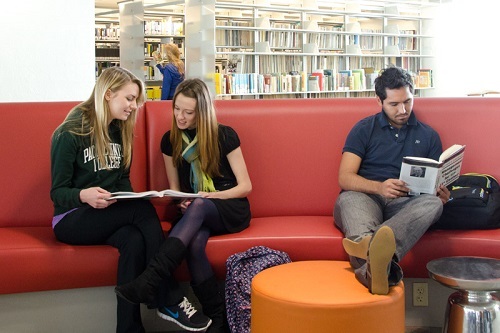 Thanks to the internet, there is one resource college students often forget about – the library. Patrick Benner and Joel Lutes, two of PUC’s librarians, gave us 10 facts about the college’s library, several of which we didn’t even know! The library is doing some pretty neat things to help PUC students do their best while they’re here. 1. You can browse over 30,000 journals at library.puc.edu. 2. 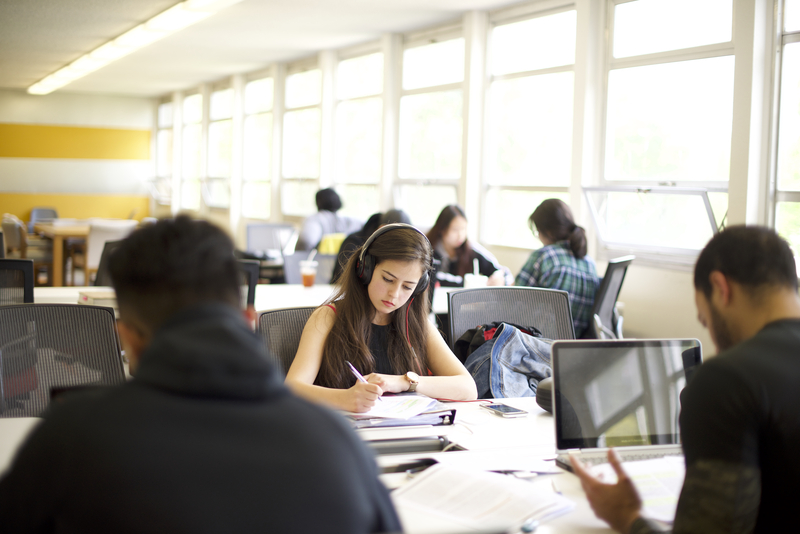 The PUC Library provides students with access to over 100,000 ebooks. 3. You can select from over four million books, DVDs and CDs through Link+. 4. The Pitcairn Islands Study Center in the library is the world’s largest research collection about the islands. Scholars come from all over the world to do their research here. 5. If you don’t have your own computer, don’t worry! There are about 60 public workstations available within the library and the computer lab areas. Printing in the library is also FREE, so if you need somewhere to print your homework, the library is your place. 6. Did you know you can check out a laptop from the library? There are 15 laptops available to students; 2 MacBooks and 13 MacBook Pros. They come with a carrying case and a charger that can be checked out at the same time or separately, and they’re able to be checked out for up to three hours at a time. You can renew them one time/day for another three hours by calling or stopping by the library. 7. There are four group study rooms that can be reserved at library.puc.edu if you need a place to study with friends for that Anatomy test. 8. You can find out what was said about your parents in old issues of The Campus Chronicle that are now digitized on the library’s website. You can browse issues as far back as 1924! 9. Research help is available until 9 PM every evening the library is open. 10. If you’re writing a paper in your room and don’t want to change out of your pajamas to go ask a librarian a question for your research paper, get out your phone! You can text a PUC librarian at 707.948.6639, and generally any texts between 7 AM and 11 PM will be seen and answered within minutes.